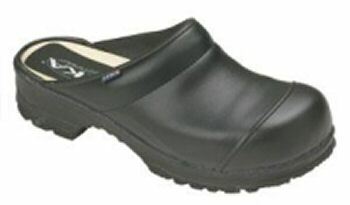 "Recently I purchased a pair of your open back Flex clogs and have been extraordinarily pleased with the comfort and support they provide, especially important as I work 12 hour shifts at our local hospital. "Thanks Shelley! You guys are great. I always recommend Sika to the other cooks at work. Have a great day! "Have recently received all my orders and am very satisfied. Thank you for all your follow up support re mail service delays. I think highly of Sika clogs, as I have had over 10 years experience with them, and will continue to endorse them.
" I received my shoes today and I am very happy with them. " Shannon and Shelley are an example of customer service beyond reproach. Outstanding. Thank you very much. First off I just wanted to say that my super clogs are awesome and I work as a Chef in a kitchen and you saved my feet/back and sanity! I've been in the super clogs for 1.5+ yrs and the treads have not worn at all! Thanks again for the amazing shoes I influence many to purchase the super clog! Twice a year without fail...I recommend you guys to all the cooks in the hotel. I received the clogs a while ago and have worn them since then. They are absolutely perfect...and I was raised on clogs so to speak. My wife loves hers too. Might order a steel toe pair this summer when I go back to fire operations.
" Dear Shannon ...happy feet are here again..so great to get my shoes..I love them.. namaste Brenda "
" This is my 3rd pair of the Superclogs so I know they will fit perfectly! Average lifespan has been about 3 years (which easily crushes the competition). I just recieved your email and I'm looking forward to trying out your shoes as I work as a department manager for walmart and on my feet a good part of 8 hours.I have a co-worker who just recieved her shoes and is very pleased with them. I just wanted to say thank you for the phone call about my shoes being shipped. My husband and I were pleasantly surprised that someone would take the time to make a call. Something so simple as a phone call can make the difference in between okay service and great service.
" Got them yesterday - you were right about the size - I really like them, thanks!" I Love the Shoes! They fit perfectly!
" I'm so in need of a new pair of SIKA! I bought my old pair 4 years ago when i was a culinary student and its not time for a new pair, i love your shoes! " I received the shoes first thing this morning! The postmaster called and said I had an express package waiting for me. I signed for them and have them in my hands. Thank you so much for your dedicated assistance during this process. You are by far the best company I have worked with. I will not hesitate in recommending this company to all my friends and family that are in need of great shoes. "I received my shoes they are a perfect fit. These are my 9th pair over the last 7 years and ALL are in useable shape and some are used for work and some leisure." I am an Executive Chef - going on my fourth pair of Sika clogs (two of the wooden soles and 1 of the Super Clogs). I really love the product and get tons of questions out here in Carmel, Ca whenever I walk between our restaurants. Model 1129- Birchwood closed back clog with steel toe. 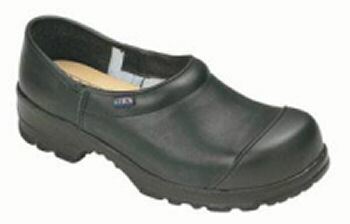 Model 101- Super clog with steel toe. "Thanks! I just received my Sika clogs today and the size 43 is perfect. I love them, they fit perfectly. Thanks again for your excellent customer service! I will pass the word around." "Thank you so much! I am thrilled, my new Sika clogs came yesterday. I love them, they are very comfortable." "Thank you for your prompt, courtesy service. Excellent ,thank you. These 4 pairs are my 12th pairs of Sika shoes." "I thank you so much. You have been great with me and I really do appriciate it. My left foot also thanks you." "Thanks a lot, you guys have been great to deal with. I'll be sure to return again and send everyone I know your way!!" "I have been wearing Sika clogs for over five years now and I can tell you that they are the best kitchen footwear available. Over the past eighteen years of working in kitchens across Canada I have worn everything from Birkenstocks to Cats and Doc Martins. The only footwear that covers every requirement for our job is Sika. They are the most comfortable on hard floors, great for back support, and despite what others claim the only sole that is both non-slip but also oil and grease resistant. I wear my clogs for about two years before I need to get new ones and it's only because I feel the need to freshen them up that it is required. Every single cook that works in my brigades over the years switches to Sika when it's time for a new pair of shoes." "We greatly appreciate your customer service, and we just had a huge discussion at lunch today and I believe I have sold most of my staff on your product! So you should see some orders coming in." "Terrific. Thanks for your great customer service. I will look forward to receiving my clogs. They are the best!" I'm looking forward receiving my 6th pair in the last 12 years! :)"
"My shoes just arrived by courier. They fit fine and feel great! Thank-you." "Thanks again for all the help in finding me the Sika 8195. They arrived today and I will be wearing them Saturday! I have a difficult time fitting shoes, and after 20 years, these shoes are by far "The Best"." "I received my shoes and I love them." "These are a great pair of clogs. I'm tickled pink." "It's nice to see in this day & age a company that is serious about customer satisfaction. I will highly recommend Sika footwear to all my cooks, sous Chefs & apprentices. It's people like you that make a good company great." "Thanks for the verification. Everything looks good. This is my second pair of Sika's so I am pretty confident with my order. I did order one size smaller than my current pair, as I have lost a considerable amount of weight since I received these and have gone down a shoe size (it is the main reason for my ordering a new pair, after 4 years they are still in great shape, just a little too big!)" "I bought my first pair of Sika's here in Lethbridge at the hospital. That was 10 years ago. They are the most comfortable shoes I have ever worn & they saved me from heal surgery. Thank you." "Thanks for the prompt shipment. The clogs are just what I was hoping for. Exceptional value! Great quality! It's been a pleasure shopping with you. "I have been wearing Sika's for the past 11 years and absolutely love them. I even wear them with my suits." "Summer is winding down but my love affair with Sika footwear continues. After retiring my faithful #149 birch wood of 4 years, I replaced them with the new super clog #101. Let me tell you after 35 years as a chef I have NEVER had a 12 to 15 hour day so refreshed on my feet. I have been wearing them for 3 weeks now and I cannot slip no matter how wet or greasy the floor is. I also purchased your models 8005 and 8105 last week, both models are so LIGHT and comfortable I don't know there on. I highly recommend to anyone who is sceptical. These clogs are amazing." "I have been wearing these shoes for 7 years. This is my 4th pair and I really like them. They are the best shoes I have ever worn." "Thanks a lot.... pleasure doing business with you guys!" "Hi. This is my 4th pair of SIKA's. I wear these in the kitchen, and I beat them up pretty good. I really love these shoes." "I've had them for 4 years now, and its time to get another pair. They're great!" "My boss just raves about these shoes. I want to be comfortable too." "I have had a pair of your steel toe clogs now for four years and they are the best steel toes that I have ever had. I recommend them to everyone that I work with." "I just recieved my white closed heel shoe and am thrilled, thank you for your extra effort to get me the right size. This shoe fits exactly like my black ones. I can't thank you enough for your time and patience. Hi, I received my shoes today, wow, that was fast! I have ordered from you before, (about 3 yrs. ago) the same duty shoe. I am very happy with the comfort and durability of this shoe. I really like them. Mine lasted two years. That's great! Thanks. I just love those shoes. This will be my third pair. These are the best clogs. They are the fifth or sixth pair that I have had. They are the best shoes I have ever worn. I had a pair of these and I loved them!! I am on my feet all day and these were great shoes. Received the shoes today, and they exceed my expectations...have had several pairs of clogs - these are wonderful. Thank you...will test them out at work in the culinary kitchens soon! These are the most comfortable things I have ever worn. I wear them all the time, year round. I love these shoes and this is my fourth pair. I have struggled with shoes for years, and I just love these." I've worn them 70 hours a week for five years. They look like they are brand new on the bottom still. I wear them in the kitchen. Hi there. First off, I just wanted to say that I'm a HUGE fan of your steel toe chef clogs. HUGE fan. I've had my pair for 3 years now. They are starting to wear down, and I'd like to purchase another pair. I have tried traditional shoes, but I keep coming back to these clogs. I had mine for 4 years and it's time for a new pair. I have been nursing since the 80's. never in all these years have I found a better shoe. I already have a pair of these. I've had them for 5 years. And, I love them. They are wonderful shoes. I just received a pair of the Sika "Super Clogs" and love them. I was also impressed with the level of service you provide. A lot of our staff are wearing them and they recommended them to me. In our kitchen there must be 6 or 8 of them that wear them and they think they are wonderful. These Sika shoes have been recommended by a lot of workers at our hotel. They say they are very comfortable to work in the kitchen. Thanks everyone. I received by shoes yesterday and I look forward to having happy feet again. THANK YOU, THANK YOU, THANK YOU FOR MY SHOES...LOVE 'EM, SADLY CAN'T WAIT TO GO TO WORK AND WEAR THEM! I just received my super clogs in the mail and I am happy. The size is perfect and they look great. Thank you very much for your help. This is my fourth pair. I am an executive chef and it's a really good shoe. They are the most comfortable shoe I've ever worn and that is why I keep ordering them! I've been wearing these for 10 years and I'd like to get another pair. I'd like to try the steel toe! It's a good shoe. I've had mine for 3 years, so it's time to get another pair! They are worth it! I had been at my friend Patrick to try these clogs for years so when I got the new ones I told him to try them out. He liked them enough to keep them so another chef is hooked! Thanks for the response. I can look forward to getting my new clogs next week. The clogs did arrive and i love them. Actually, I think you'll be getting some more business from our kitchen. Everyone has been listening to me rave about the comfort and they have asked about the web address. Much thanks. Received clogs ..look and feel great. Thank you. My Sika shoes have arrived and I have happy feet again! Thanks for your help with my order. Thanks! The clogs arrived today. My husband loves them (his birthday gift) and they fit perfectly! Thanks again. Thank you. I have received the size and they fit great. My new shoes are perfect... Thank you. Thank you for the great service...especially over the internet. I highly recommend you. I just received my birchwood closed backs yesterday and I've already placed an order for a second pair to wear outside of work. They are so comfortable! I'm excited to try them out at work where I am on my feet all day in a surgical area. Thanks for the great product! I have just received the clogs and so far so good. They also look as good as they feel, GRRREAT!!!!! Thanks for all your help. Thank you very much for outstanding customer service. I will definitely recommend you to others, and I will certainly purchase again when my new clogs wear out. I received them fine and they fit great. Great rugged comfortable product! Just what I was looking for to wear in my machine shop. Thanks for getting them here fast. I am delighted to tell you the shoes were a perfect fit. Not only was I surprised to find them when I got home from work today, but very impressed with the look and feel with the shoe. They will be very beneficial to me because I stand for lengthy periods of time, being a chef and supervisor. I have been searching for a long time for shoes like these and cant wait to give them a test at work. I think I will be needing to purchase another pair (for home use), but without the steel toe. Thank you so much for the fast and efficient service. I have to say- these shoes are REALLY comfortable- I have them on right now!! Thanks again. I wanted to let you know that I received my shoes today! I absolutely love them. Thank you. Just wanted to say thank you for getting me the clogs on Wednesday of last week. I really appreciate your effort & I love the shoes. I'll have them for a long, long time! Thank you Ecolad for the Sika clogs I have purchased from you. I am with a Food Broker Company and purchased these clogs to wear for work. I will also wear these for pleasure now. The quality is exceptional and one of the most comfortable shoes I have purchased. Thank you for the best service online that I have ever had!!! I will recommend these clogs to anyone, like someone recommended me to them at a food show. Thanks again. I purchased a pair of your professional shoes. Love them. Would like to have a catalog of other shoe styles available. The extra support afforded by the comfort model is truly exceptional. I will certainly recommend a pair of these clogs to anyone who is looking for comfortable footwear. I just ordered my third pair of Sika clogs. I love the quality, fit and finish of your birchwood closed back. I find the wood sole is exceptionally comfortable and prevents sweating feet(this leads to nasty fungus). I need another pair of SIKA. I just can't work without them. I really need them. I am hooked on them. They really help my hips. Received my shoes-thanks so much for your help! My clogs arrived today and they fit perfectly, thanks for taking the time to tell me about the size difference.